The Industrial Skeletal Multi Tool laser engraved. Executive Stainless Steel Skeletal Design. 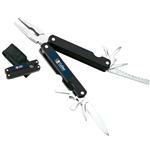 Includes Includes Pliers, Wire Cutters, Small/Medium/Large Screwdrivers, Phillips Screwdriver, Small and Large Straight Blades, Saw Blade, Fish Scaler, Hook Remover, Bottle Opener, Can Opener and Nail File. A great promotional multi tool of quality construction with your custom logo. Available Colors: Silver - As Shown. Setup Charges: $50 laser setup. Production Times Available: Standard 5-Day Production with Paper Proof. Rush production available - please inquire. Typical Imprint Area(s): 3/8”h x 1/2”w. 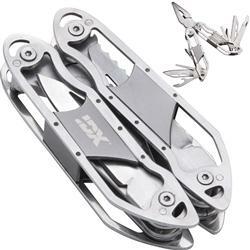 Stainless Steel Skeletal Design, Multi Tool. 25 pounds per 40 pieces.